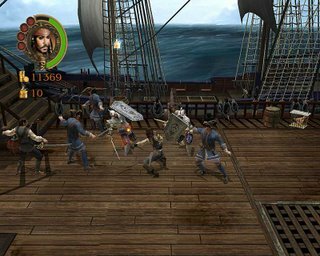 "PIRATES OF THE CARIBBEAN: THE LEGEND OF JACK SPARROW"
rated T for Teen (al­cohol reference, violence), $39.99. 1) They decided not to simply adapt the latest sequel that’s sweeping the cinemas but instead provide their own, ancillary tale involving Capt. Jack Sparrow and friends. 2) They got Johnny Depp to provide Jack’s voice for the game. And there, they seem to have stopped entirely, as though nothing else was needed to make the game a success. It’s as if a cook, having laid out all of his utensils, decides he doesn’t need the flour, sugar, milk and eggs to make his cake. The end result is a slap-dash, anemic title that sadly, remains firmly in the tradition of third-rate movie spin-offs. The game begins with Jack and whoever the name of the guy Orlando Bloom plays (you can tell I’m really up on this franchise) about to be hanged. Jack is able to stall their death at the noose, however, by regaling the crowd with tales of his derring-do, all heavily embellished by him, of course. This device allows for some good humor, as Jack’s adventures, some of which come from the first movie, are all designed to make him look good. Characters frequently comment on the seeming improbability of his stories. 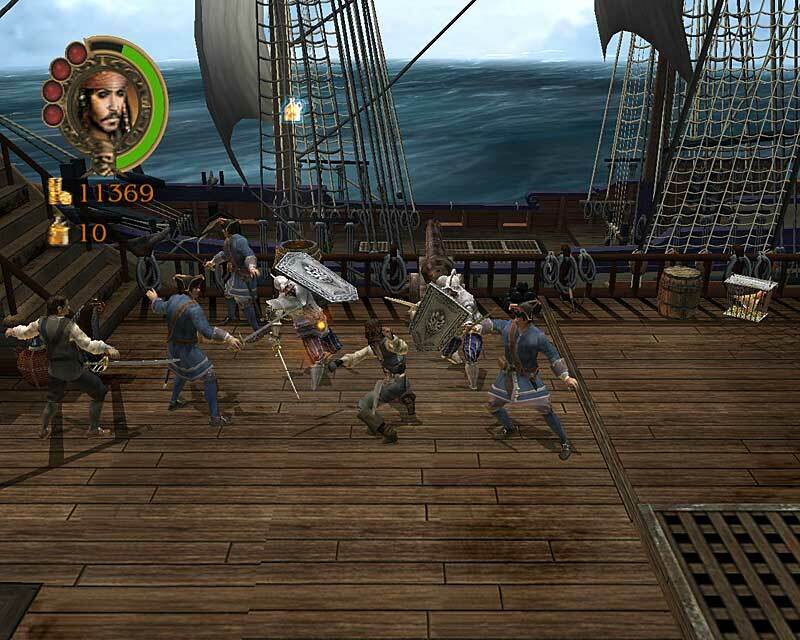 But the real meat of "Pirates" — the game play itself — is an utter failure. Ideally you should be able to use a variety of sword-fighting moves when in battle, but you can easily get by with hitting the same button over and over again. You should be able to switch back and forth between characters to add some variety to the game, but the characters are essentially identical and when you’re controlling one, the other tends to get in your way with alarming frequency. There’s more. The camera is uncooperative. The graphics are poor and overly dark. 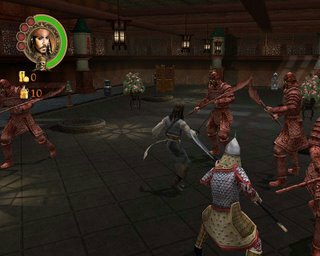 The enemies are cookie-cutter characters that offer little in the way of a challenge. I could go on. Hey, I love pirates as much as the next guy with a parrot on his shoulder and a tendency to say "Arrrr" too frequently. I long for a game that really taps into the pirate mythology and offers some serious fun on the high seas. Having played "The Legend of Jack Sparrow," I’m still longing.